If you have some teeth left which require extraction and are currently considering a denture, Click-tite dentures could be the ideal choice for you. 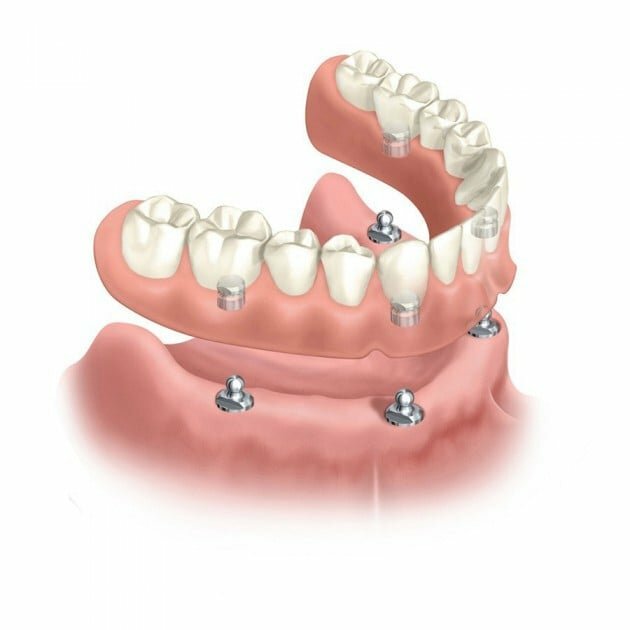 We are able to place your implants at the time of extraction, minimising the procedure time and resulting in a faster turnaround time for your final fitted dentures. Easier Eating- Dentures without dental implants often move around and can cause soreness while eating. With dental implants, the denture is kept in place so you can eat with confidence. Improved Comfort- Click tite dentures are more secure than regular dentures. That means less rubbing on sensitive gums while you are eating. You will be more confident with dentures secured by implants as they will not move while you speak. Better Tasting- With click-tite dentures there is no more sticky denture adhesives. Patients often tell us how awful the taste and feel of denture adhesives is in their mouth. After all, who wants to be eating glue when you can eat real food! Improved Appearance- Reduce premature ageing by maintaining more jawbone with implants. Improved Oral Health- Less ulceration and damage to gum tissue from movement. If you have dentures with some teeth, often the dentures will cause gum damage to the teeth over time. With implants this is minimized. Everyone deserves to have beautiful and secure teeth. Exclusive to Seapoint Clinic in Dublin, the Click-tite™ system gives you secure dentures, allowing you the freedom to bite, chew, and talk with confidence and with a reliable set of secure teeth. If you would like to get rid of dentures completely, click here. How do Click-tite dentures work & what is the process? Your specially-made dentures are anchored onto a number of dental implants (typically four) and clicks into place. Your Click-tite™ dentures will remain securely in your mouth but can easily be removed for cleaning, etc. If you have some teeth left which require extraction and are considering a denture, now is the perfect time to get Click-tite™ dentures. Your implants can be placed at the time of extraction, resulting in a shorter procedure time and faster turnaround time for your final dentures. Typically, we can make and fit the final dentures just two months after the Click-tite™ implants have been placed. Don’t worry, you will not be left without teeth at any time throughout the healing process! Click-tite™ dentures will also maintain your jaw bone around the implants, ensuring you will continue to enjoy a strong jaw bone and dental security. They also reduce negative facial profile changes that normally occur without implants. "It was so much more comfortable then when I just had dentures." This is the best way to secure dentures and it involves placing several anchors in the jaw, which are then attached to the denture. The more implants placed the more secure the attachment. We can easily increase or decrease the retention for you to make them strong enough to stay in comfortably but easy to remove when you need to. These are dentures that you can take out to clean but will not come out and embarrass you at other times. Eating any food is possible with Click-tite implants as they will make the denture much more secure so that there is very little movement. These Click-tite implants also preserve the jaw bone and help to stop facial profile collapse. The VHI will make a contribution to the cost of these in the lower jaw if you have no remaining teeth and struggle with dentures. They are also tax deductable. If you still have some teeth present which need to be extracted, it is often possible to place these implants at the same time as the extraction is performed which makes the whole process even easier. If you decide later on that you would prefer to have fixed teeth it is usually possible to upgrade the implants to provide fixed teeth. This is not possible with mini implants as they are too small to support the additional forces. Seapoint Clinic’s micro implant technology is the most gentle type of implant available. While it does not give the strength of Click-tite dentures, it can be a huge improvement for people compared with denture pastes and glues. It can be placed with minimal discomfort, stitches or bleeding in one simple visit. Most patients experience little or no discomfort after this procedure. These innovative mini implants are placed in a keyhole fashion directly through the gum so that they are easily placed and suitable for anyone who is missing all their teeth. These implants will still allow slight movement of the denture but are much more retentive and healthy for your jaw than pastes. These are an excellent way to make loose dentures more secure and to preserve your jawbone and facial features. Micro implants consist of a miniature titanium implant that acts like the root of your tooth and an O-ring that is incorporated into the base of your denture. This makes your denture much more stable and stops it moving or coming out when you talk or eat. It allows small movement of the denture but will not allow the denture to fall out unless you choose to remove it. These mini implants allow you to chew all sorts of foods again that you may not have had in years such as steak, apples and even chewing gum. "I nearly fall asleep when having my treatment. It's a very relaxing experience." Is the micro dental implant safe? Yes. The Food and Drug Administration (FDA) has approved micro implants as a long-term item. As they are so small they are very easily placed and so cause very little discomfort. They are regularly placed in people of advanced age because they are gently placed. When can micro implants be used? Micro implants can function as long-term supporting structures. In fact, some have been successfully functioning in patients’ jaws for several decades. In the past several years, some clinicians have been using Micro Implants for single tooth replacements and in crown and bridge cases. We only use them for making dentures more stable where they have the highest success rate. What is the primary use for micro dental implants? The most effective use of this unique dental product is securing a lower denture. There are millions of people worldwide lacking teeth, or who struggle daily with loose teeth. Uniquely, the micro implants can be utilised to stabilise a denture in a couple of hours at Seapoint Clinic with the patient leaving the clinic with a stabilised denture. How can micro dental implants help denture wearers? Micro implants are placed in a painless procedure and require only a mild local anaesthetic. The micro implants, approximately the size of wooden toothpicks, are placed about five millimetres apart. The patient’s denture is then carefully adjusted to allow it to clip onto the four micro implants. The result? A tight fitting, completely reliable system that allows a patient to speak and eat with confidence. The micro dental implants are placed in about an hour. Because of the unique, minimally invasive procedure, the minute size of the implants, and where they are placed, the typical micro dental implant patient could enjoy a light meal the same day as having the mini implants placed. A denture patient who has had his or her denture stabilised with micro implants can remove and replace the denture easily after a little practice, and can easily utilise good dental hygiene. How much do these micro implants cost? The cost varies depending on the size, number and complexity of the case. If you have health insurance you may well be entitled to get the treatment completely free of charge. Micro implants generally cost less than regular implants and are a very inexpensive way to secure a denture. Have a look at our pricing page for details of the cost. Why should I get micro implants done at the Seapoint Clinic? We have been placing micro implants (and regular implants) for years and have a great deal of experience and education in the area. We have changed many people’s lives with these remarkable devices. If you would like to talk to someone who has been through this procedure please contact our Implant Patient Coordinators who can put you in touch with real patients who are happy to share their experiences. How do these mini implants help with bone preservation, socket grafting & ridge preservation? When a tooth is extracted there will be a hole in the bone. Often the bone has been damaged by infection before the loss of the tooth, and so will be thin or even have a hole present in it. If we allow the socket to heal naturally there will be bone loss in the area afterwards. The exact amount will vary depending on the situation but it will happen. If we place a socket graft at the time of the extraction, we can considerably reduce the bone loss that takes place. This can mean the final tooth looks better, feels better and lasts longer. Socket grafting is a simple procedure that takes place while you are numb after the extraction. We clean out the socket and fill it with a bone substitute. Over time this bone substitute is replaced with your own bone and so the jawbone is maintained. After the appropriate healing time, dental implants should be placed to preserve this bone in the long term. If you are not planning on getting implants done a socket graft may still be worthwhile. We can use some bone fillers which reduce reabsorption of the bone and so will keep the bone profile for use under a bridge. Socket grafts are a very gentle way of preserving bone and should be carried out often when a tooth is due to be extracted. Ask your implant dentist at Seapoint Clinic if you are a suitable candidate for a socket graft.